It was such a surprise to step outside this morning and find these little beauties. This is my next entry in Becky’s ‘In the Pink’ Square in September photo challenge. I’ve been watching the flower heads for a few weeks now, and although that sounds like an odd thing to say, we are only in the fourth week of Spring and Hoyas usually flower in Summer. I surprised by, and can hardly believe, just how many flower clusters there are on the vine. Total count today = 12, yet only five of those are either opened or about to be, with the rest still quite small and only just emerging. On September 6, I shared photos of my Hoya that I’d taken in January, but these photos were taken today. It’s cloudy outside, rather gloomy, and has been raining on and off. I’m a little disappointed with the colour, or I guess I should say, lack of colour. However, you can still see their soft pink, and that’s good enough for me to post this in Becky’s challenge. There are lots of flower buds hiding in this one. See how they hand down. Emerging bud, as is the one in the background (on the left). These are so cute and fuzzy. Beautiful in close up, and a lovely addition to the challenge today. 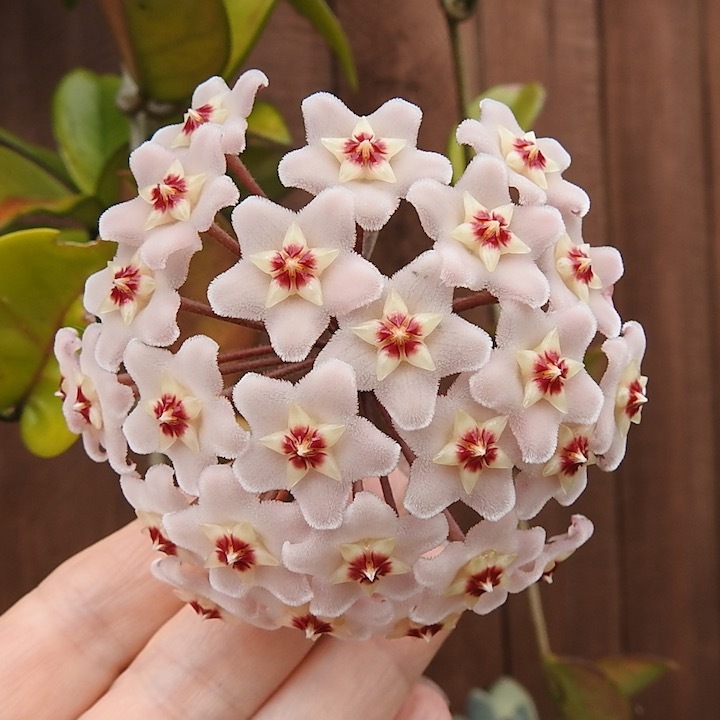 I adore the starry flowers of hoya! Mum used to grow it as a pot-plant in her tiny conservatory. Your hoya is lovely! Thank you Liz. My Aunty Pat would be so proud. This is a ‘Grow it Forward’ plant. Oh how wonderful… its a real treasure!